personal goals - aligned with your life's mission and purpose. Your personal goals should be grown from your values, beliefs, passions, and your sense of purpose. Before you begin to create our goals, you should go through the process of self discovery. Determining your values and mission in life is a critical process of goal setting. Personal goals that are aligned with your values and mission are your most motivating and inspiring goals, and the ones that are most passionate to achieve. They also deliver the greatest sense of pride and satisfaction once accomplished. 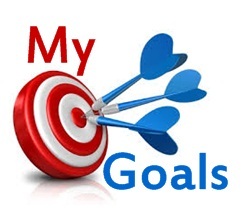 You should set your goals so they are directly aligned with your life’s mission and purpose. If your goals do not reflect your values or sense of mission, you will struggle to find the motivation to reach them. For example, if your highest value is “time with family”, you want to consider building that into your goals. It will guide you to what you need to change in your life or where your focus should be. There are different types of goals. Some goals are lifetime goals; meaning that we intend to achieve them before we die. To achieve them, we break them into smaller steps, perhaps ten-year goals or five-year goals. These intermediate goals are then divided into smaller steps, until we have subdivided the lifetime goals into immediate goals that we can work on today. Setting personal goals starts with your lifetime goals which are followed by a series of lower level goals. The series of goals and objectives can continue until you have a list of daily tasks. By setting up this structure, you are able to break down life goals into a number of small tasks that you need to do each day to reach the lifetime goals. People set lifetime goals by envisioning what they ultimately want to achieve in various facets of their life. They then set additional long-term goals for themselves by envisioning what they want to be doing and where they want to be five to ten years from the present. Then they use short-term goals to get there. To set goals; first, write down your goals, and secondly lay out your plan of actions that will determine how to you reach them. Once you have set your long-term goals, set up your short-term goals that you should complete if you are to reach your lifetime plan. You can set a 5-year plan, 1-year plan, 6-month plan, and 1-month plan of progressively smaller goals that you should reach to achieve your lifetime goals. Each of these should be based on the previous plan. Finally, set a daily “to do” list of things that you should do today to work towards your lifetime goals.